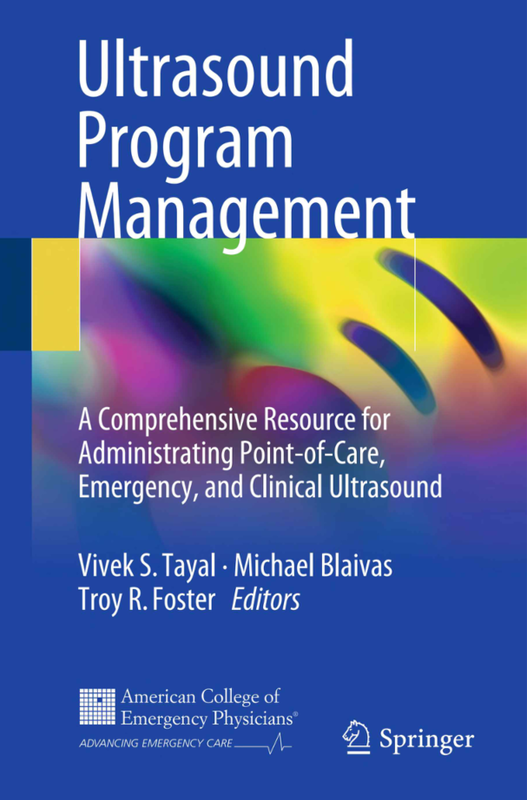 ltrasound Program Management: A Comprehensive Resource for Administrating Point-of-Care, Emergency, and Clinical Ultrasound is a pioneering, exhaustive how-to guide for establishing and managing an ultrasound program. It covers a variety of issues that many program leaders may face, including negotiating for equipment, acquiring adequate staffing, and working with other programs in the hospital or institution. The book also examines various ultrasound education methodologies. In Chapter 11, “Simulation Medicine,” ultrasound simulation training products, such as the SonoSim® Ultrasound Training Solution, are found to augment ultrasound education for all levels of learners and provide standardized practice on a recurring basis. The book asserts that simulation training products are desirable tools for building ultrasound programs due to their scalable nature, providing an edge over traditional training methods alone. Tayal VS, Blaivas M, Foster TR, editors. Ultrasound program management: a comprehensive resource for administering point-of-care, emergency, and clinical ultrasound. 1st ed. Switzerland: Springer International Publishing; 2018. If you are interested in learning more about ultrasound simulation training, or ultrasound program management, please find the book on the SpringerLink website.